Introducing the Foodists Guest Contributor column. This space will regularly feature travelers, subject matter experts and people we generally like. Today Annika Reinhardt, our foodie friend travelling through Europe, writes about her favorite German wine. Enjoy. 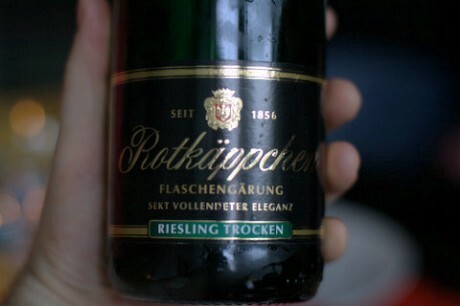 I’ve lived in seven different countries from Europe to North America and as much as I’ve always immersed myself in the local culture, there has been one thing from Germany that I could not live without – Rotkäppchen Sekt, Little Red Riding Hood Sparkling Wine. Now some of you wine connoisseurs might think “I’ve never heard of this divine bottle before” which is no surprise. I was born and raised in Eastern Germany and the sparkling wine company with the fairy tale name has been as much part of the former GDR as it has of my life. A success story from a business perspective and a love story between a girl and a cuvée she just could not let go of. 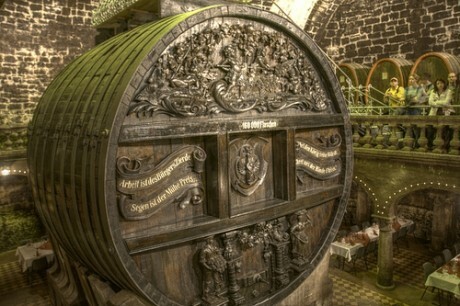 Rotkäppchen Sekt is made in Freyburg, which is situated in the most northern wine region of Germany called Saale-Unstrut. It’s located about 3 hours Southwest of Berlin. We are probably most known for our Müller Torgau and I’d even say we have some pretty nice Rieslings. Most of the wines never make it past the province border as the production is fairly small, similar to the Okanagan. Rotkäppchen was established in 1856 at which point it sold its tasty liquid under the name Monopol. Unfortunately, there was also a champagne maker in Champagne that was called the same and after some trademark back and forth, the company lost its name. (Wow, this whole sentence rhymed!) The bottles always had red caps though, hence some smart dude or dudette decided to call the brand little red riding hood or more specifically ‘red cap’, a name that has prevailed for over 200 years now. After Germany was separated into East and West the company flourished and became the #1 sparkling brand in Eastern Germany. I am sure the Russians had a constant delivery of the bubbles which were supposed to give you wings (yes, they actually had the idea before Red Bull did as the logo is a bottle with wings!). After Germany was reunified in the late 80ies the company went downhill as there was no room for Eastern German brands in the market. Everyone thought, that was it, yet another company ruined by the aftermath of communism. Until the management at that point decided to buy the company out. Probably the best thing that could have happened. At its lowest point the company employed merely 30 people, today over 500 people work at Rotkäppchen. Significant expansions have also taken place such as the acquisition of world renowned brand MUMM. Business could not be better: almost 50% of all sparkling wine bottles sold in Germany wear the little red cap. The company offers a variety of sparkling wines made from various cuvees (a blend of different wines which is then used for the second yeast process) as well as single varietals (my favourite is the local Riesling they make which actually has a golden and not a red cap, it’s that special!). They also have some random mixes like their sparkling wine with mocca flavour. It’s a dessert wine and was created at a tasting / meeting where one of the participants poured coffee in his champagne glass by accident. I assume everyone was so boozed that they thought it would be a fun idea to make a sparkling wine that tastes like coffee. But hey, why not? I actually used to work for the company and give tours of the facility which included a glimpse at the biggest wooden cuvée barrel in the world. My favourite part about the tours was the fact that I always got to end them with a glass of bubbles. With the guests of course, not by myself! You can imagine how much fun evening tours with Annika were if I started working at 10 AM! Now, you might ask is this sparkling wine really that good that somebody like me can write a whole blog post about it? To answer this question, you could ask your fellow Foodists as some of them had the opportunity to try Rotkäppchen at one of my Social Bites Dinner Excursions. I obviously love it but also had better champagne in my life, no question. I am saying champagne as many of the bottles are actually turned by hand during the second yeast process, just like in Champagne. But that’s not the point. It’s the connection to home and the fact, that every time the sweet bubbles disappear in my mouth, a million memories reappear. We all have foods & drinks that have that impact on us. Things we just can’t let go of. Maybe it’s your grandma’s apple pie which brings you back to joyous days of endless laughter, climbing trees and riding ponies…ok, maybe not ponies but you know what I mean. That apple pie is as much part of you as your nose is, and who wants to live without their nose? I mean really! That’s how I feel about my champagne, oops! – sparkling wine, of course. I am currently exploring Europe and as much as I am excited to bring back some interesting wines from France or Italy, they will always only be second choice next to my beloved Rotkäppchen sparkling wine. And if you are lucky, you might get to try some when I’m back in Vancouver. I’m not always a huge fan of the bubbles, but I’ve had the great pleasure of having Annika pour me some Rotkäppchen Sekt, which I enjoyed—and paired wonderfully her raclette. Can you buy it anywhere in Vancouver Annika? I can understand that whether or not it’s the greatest bubbly, it’s always nice to have a bottle which has a good story behind it. I have (and had) a few of those myself, but never this Rotkäppchen. Would they happen to also make a wine called the Big Bad Wolf? Now that would be one of very few German reds I would love to try. Unfortunetly, u can’t buy anywhere outside of Germany. They used to export a ruby sparkling to China but don’t think they do anymore. I will bring more for sure. Funny thing is I actually did an export market study for them a couple years back and it showed that Canada would be worthwhile exporting to but their production is too small. Also looking fir the Big Bad Wolf bottle. Will keep u posted. You can buy it in North America, and in Asia. There are official distributors and resellers and if you email the little red cap then it tells you where to go, in a whispered email. It worked for me in Asia (Hong Kong & Singapore).